Model: New model plus frozen air effects for Irelia, her blades and Mantle of Decorum. Particles: New blue particles for her abilities. Frostblade Irelia is a skin that delivers a great look for Irelia coupled with very nice particle effects. 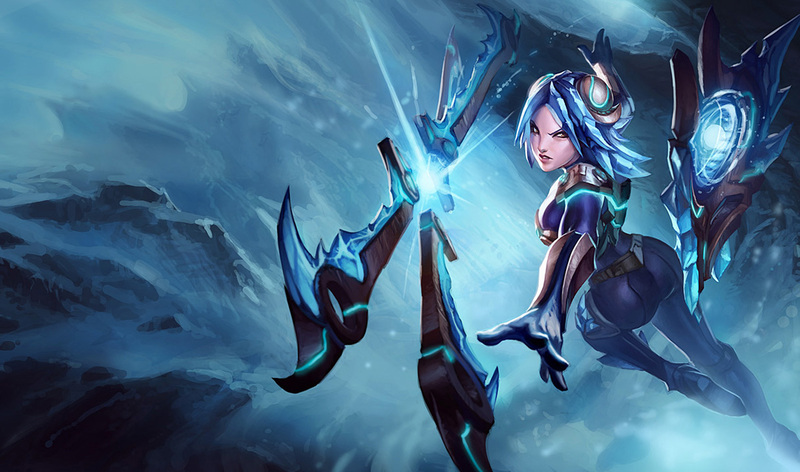 The ice theme is clearly delivered, not only by the ice blades but also by decorative ice shards on Irelia’s suit and frosty effects for her abilities. The suit is particularly well thought as it’s practical yet visually attractive without exaggerating on the ice. The blades are well designed and the colors used unify the suit and blades making for a cohesive and fascinating look. All things considered, Frostblade Irelia is an excellent skin; in spite of being released with a glaring oversight. Due to the fact that this skin is neither rare or hard to get, we have focused not to write so much about it. Everyone can get it right now if you have the money for it! We are not sell this skin, but ELO Boosting service for sale. We would also like to point out that the only way to ever getting this skin is through the official Riot store, where you buy it for Riot points. There is no point looking for it on Ebay or other third party sites, it simply does not exist!